Growing annual flowers offers two advantages over growing perennial flowers. First, annuals bloom profusely throughout the growing season. Second, many favorite annual flowers freely self-sow and weave their way through your garden year after year. Self-sowing flowers are what we refer to as "volunteers." They do the work for you, and no flowers do it better than annuals. Only open-pollinated and heirloom varieties of any plant will grow true from seed, meaning the seedlings will be exactly like the parent plants. (A pink hybrid geranium will give you white or red geraniums the following year, for example.) But there are many open-pollinated, self-seeding annuals to choose from, and even if you do get some unexpected seedlings, who's to say you won't like them? That's where new plants come from. When growing self-sowing annual flowers, you need to allow the late-season blooms enough time to go to seed. If you've been deadheading all summer to keep the blooms coming, stop deadheading by the middle of August. The seeds need to ripen, and that usually means the flowers must dry completely. That's about all it takes. They don't call them self-seeders for nothing. Other fall bloomers in your garden will have to distract you from the browning annuals. If nature cooperates, you'll be seeing volunteers in and about your gardens next year and for years to come. Annuals that have self-seeded give your garden a natural look. However, sometimes they seed too enthusiastically or plant themselves where you wish they hadn't. Fortunately, self-sown annuals are easily transplanted to other spots in your garden or potted up for friends. Or you could take matters into your own hands and simply save the seeds and sow them yourself the following year instead of letting nature take care of the propagation. Then, either scatter the seeds directly into the flower bed or start the seeds indoors next spring. Light: Some seeds need light to germinate and should not be covered with soil. Scatter these seeds and lightly press them into the soil with the back of a hoe or a board. Other annuals require darkness, which can be easily achieved with a top layer of soil. Scarification: Several annual flowers protect their seeds with hard coverings. To improve the odds of these seeds germinating, scarify, or nick, the outer covering by rubbing with sandpaper or chipping the coating with a sharp knife. Use caution with the knife method. These seeds are hard and tiny, and it's so easy to miss. It's easier to soften the seed by soaking it overnight. Cold: Besides moisture, some annual flower seeds, such as poppies, require a period of cold before they are triggered to begin germination. Nature takes care of this for us when the seeds are left on the ground during winter. If you are starting seeds indoors, place the potted seed in the refrigerator in a baggie for the recommended amount of time or in the garage, depending on the temperature. This is called stratification. When to sow annual flower seeds outdoors depends on the type of seed and your climate. The best indicator is nature. If certain annuals reliably self-sow in your garden, you can bet they prefer being sown in the fall. Annuals that disappear after a season could simply be sterile hybrids, or they may prefer warmer germination conditions. For example, you can save seed from many marigolds, but it is rare for them to self-sow in cold climates. Short-season gardens stand the best chance of getting a lot of self-seeded volunteers during winters with good snow cover, for insulation from the cold, drying winds. Obviously, only seeds that can handle a period of cold are going to self-seed in these gardens, and you will need to ensure that you have allowed the seed heads to mature before your first frost. The option of saving seed and direct sowing it in the garden in the early spring, just before you expect the frosts to subside, might work best for gardeners in colder zones. Those of you in moderate zones have the best of both worlds. You have a longer period in fall to allow seeds to ripen and drop. You also probably get enough of a cold spell for seeds that need a chill to germinate. Gardeners in zones 9 and higher can also allow seeds to self-sow in the fall. But your annuals will likely grow and flower in winter, rather than waiting for spring. Unless your weather is very dry, you will probably get several seasons of volunteers. 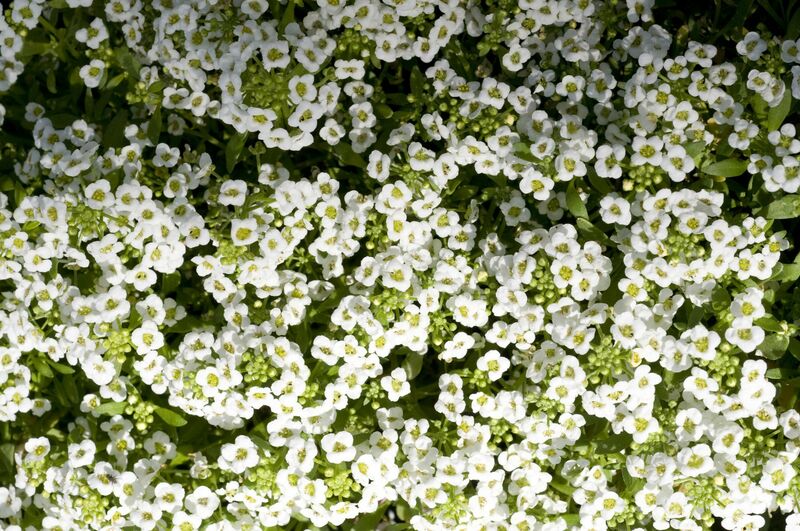 Alyssum makes a lovely, low-growing mat that is perfect for edging paths, the front of a border, or containers. Most varieties have a sweet, vanilla-like scent. Some of the recent hybrids do not come true to seed. It's hard to beat the blue color of bachelor's button. It got the name "cornflower" because it grew as a weed in cornfields, but you may welcome it in your garden. It does spread, but it is easy to pull out any extras. Unlike perennial woodruff (Galium odoratum), the annual Asperula orientalis has small, deep blue flowers. It is often considered a wildflower, and the volunteers will look good poking through other plants in the garden. A word of caution: Rabbits love to munch on the new, tender plants. You'll find the seed of California poppy in a lot of wildflower mixes, but you may have better luck growing it on its own. The delicate orange blossoms sit on airy, fern-like foliage. The annual candytuft comes in more colors than the white perennial variety. These are cool-weather plants that should be seeded early so that they can bloom before summer's heat. Cottage garden plant Clarkia amoena can grow 2 feet tall, with long stems of flowers. USDA Hardiness Zones 7 and above can seed them in the fall for blooms throughout winter. Cooler climates should seed in early spring. The annual coreopsis, also known as calliopsis, is even more free-flowering than the perennial varieties. If you have problems with perennial coreopsis spreading and taking over your garden, the annual variety is a good option. And birds will eat some of the seeds the flowers produce. The variety of cosmos flowers available grows larger every year. You can find delicate pastels and brilliant, bold reds and oranges. They are profuse bloomers and will all be frequented by bees and other pollinators. Although technically a perennial plant, blue flax is short-lived, at best. However, it readily reseeds itself and stays in bloom for weeks on end. The vivid blue flowers blend well with most other plants. Forget-me-nots are among the most enthusiastic self-sowers, so you may need to do a bit of editing in the spring. But the cheerful and abundant blue flowers are a lovely cottage garden addition. There almost are enough varieties of black-eyed Susans for everyone to have a different favorite. The annual varieties bloom even more abundantly than their perennial cousins, often with larger flowers. Tall larkspur prefers cooler climates. When starting your first patch, you may have better luck with germination if you stratify your seeds before planting. After that, winter will take care of it for you. All parts of the plant, including the seeds, are poisonous if ingested, so use care around children and pets. Love-in-a-mist can be direct sown early in the season and then succession planted throughout spring. Its blooms don't last long, but they are gorgeous and are soon followed by their quirky seed pods. Malope is an annual mallow, and the flower resemblance to perennial varieties of mallow is strong. You can direct sow or start some seeds early to transplant after the danger of frost is past. As a bonus to their beauty, the flowers are edible. Flowers in the genus Melampodium are a relative of the sunflower although considerably shorter. They form a short mound that looks lovely placed at the front of the border or in containers. Melampodium is is a good choice for dry areas of the garden. Not everyone is impressed with the yellow-green, spiky blooms of mignonette, but the intense honey scent may win you over. Mignonette does best in a sunny spot with rich soil. If you are starting from seed, don't cover it; mignonette needs light to germinate. Portulaca seed will travel. You can plant it in one part of your yard and find it growing all over the place later. However, the plants are small and not aggressive. Choose a sunny spot, because moss rose flowers open only when the sun shines on them. Nasturtium seeds are large and easy to handle. They are also edible, as is the rest of the plant. Indeed, the seeds make good substitutes for capers. If you can resist eating them and allow them to fall off the plant, you will have nasturtium plants popping up year after year. Pot marigolds are also edible. The flowers have a mild floral fragrance, but the leaves are quite tangy. Allow some flowers to mature and set seed and you will have volunteers in the same season and for many seasons to come. There's purple everywhere you look, with these purple hyacinth beans: the flowers, the stems, the seed pods, and the undersides of the leaves. The beans are edible when fully cooked, but many gardeners grow them just as ornamentals. Let some seeds fall and save some to plant elsewhere. The flowers on this annual Euphorbia are not much to look at, but the white bracts make it appear as if the plant is always in flower. This plant stays colorful all season, and those nondescript flowers obligingly drop their seeds so that you can enjoy the show all over again next year. Spider flower doesn't start blooming until midseason, after it has grown 3–4 feet tall. Then it sends out loose balls of blossoms that bloom over several weeks. You will get volunteers the following season. Do note that spider flower does cross-pollinate, so if you planted more than one color, you will get a whole new mix of colors next year. Sweet peas do not self-sow everywhere, but if you are lucky to be in an area where they do (such as zones 8–10), be prepared for some surprises. The plants will cross with other sweet peas, or hybrid varieties may revert to one of their ​parents' features. But have you ever seen an unattractive sweet pea? Tall, or Brazilian, verbena sends up long, branching stalks of 2 feet or more, with tight clusters of purple flowers. Be prepared to see butterflies taking over your garden. The self-sown seeds are late to emerge in the spring, so hold off mulching until you see them. Gilia thrives in dry, sandy soil. The small, globe-shaped flowers look best in a large planting, so allow them to set a lot of seed at the end of the season. Gilia is a heavy nectar producer, so you will have to share the flowers with the bees.